About a week ago I learned that my uncle Raymond died. He was seventy five and had been living for the past couple of years with a caregiver who he really seemed to like, which allowed my aunt and uncle some respite in their twilight years. I am republishing this post in memory of my uncle Raymie. Knowing him has made me a better person. My uncle Raymond, who is now in his early seventies, was born deaf and his development was retarded. 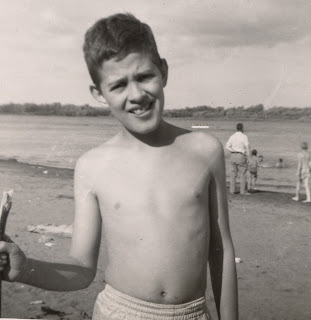 My mother, who is ten years older than her brother, went off to college at sixteen leaving him behind with his older sister, Carole, my aunt, who at the time was only eight. I remember, when I was a child, visits from my aunt, uncles and cousins. Raymie, as we called him, would putter around the house with his unmistakable shuffle, grunting and vibrating his pursed lips, “bbbrrrr, bbbrrr, bbbrrr” like an infant making a raspberry. It must have felt good because—to him—it was silent. I recall trying to teach him a simple card game. I wrote basic instructions on a piece of paper since I could only sign a few words and Raymie's signing was limited. He just got confused. But Raymie liked crafts and tinkering. He'd fix flat tires on bicycles and each year he'd send us a beautifully hand-sequinsed cloth calendar adorned with brilliant exotic birds. About twenty-five years ago Raymie was diagnosed with Autism. He had lived from childhood into adulthood with his mother. She divorced my Grandfather when Raymie must have been about ten and she was left a widow by her second husband. It was after that that my Grandma and Raymie moved into a trailer on my Aunt Carole and Uncle Jack’s farm in Oregon. The two lived in the trailer, packed with antique furniture and nicknacks, until she died. Raymie was left to be cared for by my aunt and uncle, whose four children I believe had since grown and left home. Since then, and for nearly twenty-five years, Raymie has remained in my aunt and uncle’s care. They have been responsible for his meals, his health, his hygiene, his clothing, his shelter, his transportation, and his services. They've kept him active in programs for the mentally retarded. They have taken Raymond with them on their vacations, to dinners, to functions, on outings—everywhere. When he was younger he was prone to running away and to fits of rage and vandalism, particularly after his father's and mother's deaths, so leaving him by himself has never been an option, and in any case he is not capable of being independent. Over the years I have tried to grasp the immense responsibility that taking care of my Uncle Raymond must entail. I am only beginning to understand the tremendous, ongoing task of helping him bathe, of keeping him in good health and of trying to diagnose the source of pain, discomfort or anguish in a man who has great trouble expressing himself and would just as soon try to hide it. And in my gradual comprehension of their reality I have gained perspective, and thus great admiration for my aunt and uncle, and my cousins who have also helped in his care. I appreciate them for keeping and loving Raymie for so many years, this man who is still very much a child. I can never intimately know their hardship or their joy although, because of life with my son Calvin, I am beginning to learn. I am sorry for your loss. This was beautiful.